This historic building has been completely renovated and has been leased and used as an accredited school by the former tenant continuously for the past 8 years. It is now available for a new tenant's lease or to be sold outright. It's move in ready, certified to operate and ready to go. Classes could even start this semester, if you act fast. 16 classrooms plus offices, a gym, cafeteria,and other rooms and areas for storage allow an enrollment of about 300 students. There's a large well-equipped playground and recreation area in front plus ample parking. 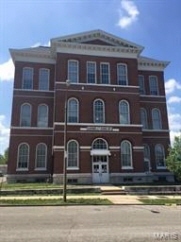 $4,800,000 was spent to bring this school building back to life and into the 21st century from it's original construction almost 150 years ago. It can now be yours for one third of that price and you don't have to spend a year building it. It may even come with some furnishings. Based upon the projected rent and known expenses this is priced at a 10 cap for investors who have a tenant for it already or want us to place one for them.